It was one of the most exciting and windy Sylt finals since I participated in the event at the North Sea for the first time in 2005. It was the 8th time competing on the island, where JÃ¼rgen HÃ¶nscheid, the former German waveking, grew up and where more than 10.000 spectators show up every year. In a great mood on one of the first days on Sylt (Pic: PÃ¶tsch). ItÂ´s great to compete there, even to rig a sail as people show up, talk to you, ask for signatures, analyse your results. 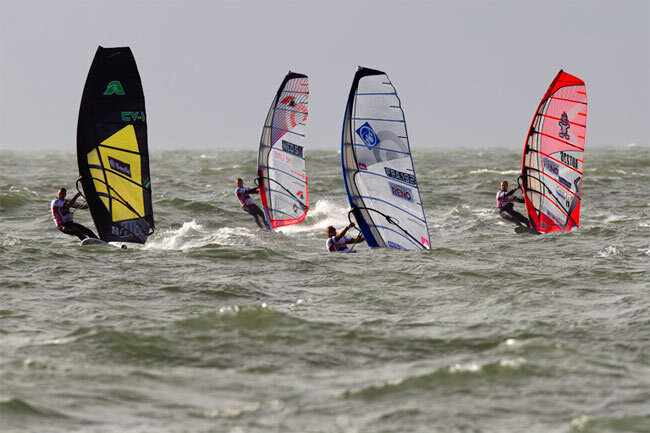 ThatÂ´s definitely an event, where the contact to fans and other windsurfers is quite high. The gear area at Westerland (Pic: PÃ¶tsch). And in between all this positive vibes I made a big fault in my first race. I was placed in a good third position after the final mark. Antoine Albeau was behind me as he crashed very hard on the third leg. Looked like he hit anything in the water. Andrea Rosati and Ludo Jossin passed the last mark on the left hand side. I almost was over the finish line, but was convinced that both of them went on the wrong side. Â I had the words from the skippersmeeting in my mind: “You must jibe around the last mark .” And that was what I did. The moment of no return. passing the finish line on the wrong side (Pic: Carter/PWA 2012). And that was wrong. The racecrew decided to change the course, while I was out on the water getting ready, testing a new fin and prepare on the water for my start. Nobody told me, that the crew had changed the course. What a bummer! There was just a meter and 50 cm in between right and wrong. I did not have any advantage due to the fact that I passed the line windwards. But within a part of a second I felt that something was very wrong, when my nose of the board spotted outside the North Sea . It was a horrible moment as I knew how close the fight for the worldtitle was. The boat of the racecrew was parked relatively close on the upwind side of the mark, what confused me too. And I was not able to spot the leeward placed finishing flag at the shore as this flag was placed really far upwind. I got disqualified. And Antoine made it up into the second round, what was extremely necessary for him to win the title. We only had two valid eliminations in the end of the event and it was not possible to correct the mistake. After a fault like this you quarrel with fate for a long time. ThatÂ´s the reason I now updated my blog with the report about this mistake, not earlier after the event. Arnon Dagan told me staright after my fault: “Pack your gear and travel back home!” Â At this moment I didnÂ´t believe it that I went wrong! Straight after the mistake had happened I had to explain what happened to Ben Proffitt, who was the moderator at the livestream. He thought that a wave pushed me up. But that wasnÂ´t the reason as we had reallly small waves compared to other races in previous years. 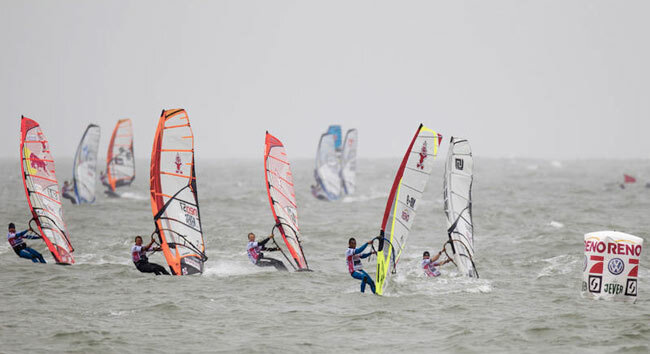 Had a nice first round in elimination 3 at Sylt (Pic: Carter/PWA 2012). I understood that faults can happen, but was extremely disappointed. I tried to give it all in the following two rounds and made it up in the third elimination into the second round. But afterwards the wind did play a crazy game. The seabreeze always showed up an hour before sunset. The boats of the racecrew Â had to leave back to the harbour, which is located one hour away from the Westerland beach. The final day saw awesome wind, but big waves and a lot of current. There was no chance to get the boats out and it would have been hard to guarantee the safety. Overall the action was great at Sylt with a full double elimination in Wave for women and men, a full double elimination in Freestyle, an explosive Night Session, a nice Filmfestival and two rounds of Slalom. LetÂ´s hope that 2013 will see more Slalom racing again. Thanks to everyone, who supported me in 2012! 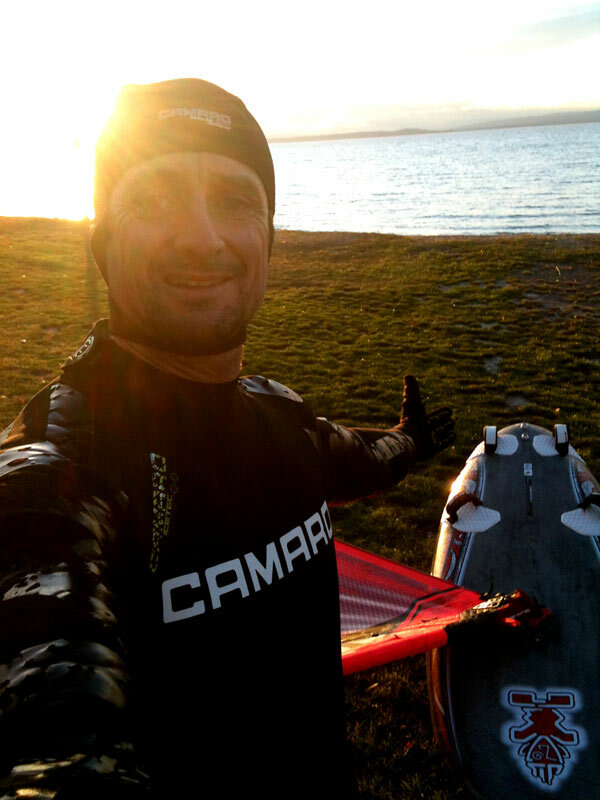 A selfportrait after a nice session a few days ago in November 2012. Now, back at my homespot Lake Neusiedl, I had some really nice sunset sessions with the sun setting behind the soft hills. ItÂ´s amazing how beautiful the conditions are in late fall. Just a few guys are out there with their sailboats, kites or windsurfing boards…and me. I am looking forward to get prepared very well for 2013. No tourplan got released until now, but we can expect races in South Korea, Spain, Canary Islands, perhaps France, Turkey, Holland and Germany. Perhaps we will see an early start of the racing season in the first week of March 2013 at Mui Ne, Vietnam. 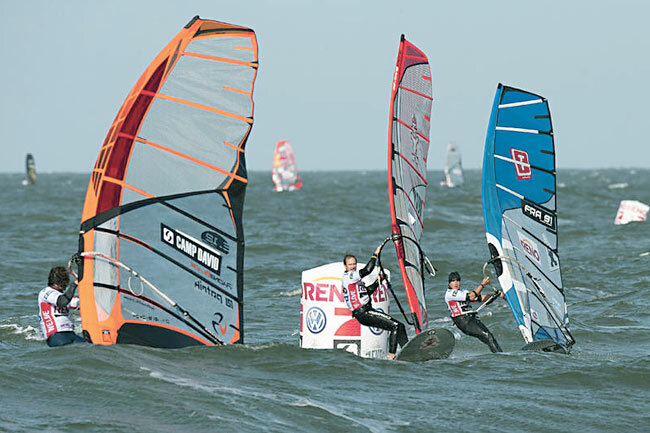 In 2011 we had an exciting PWA Worldcup there. And I really hope to have some nice waveriding sessions during the wintermonths. ThatÂ´s what IÂ´ve been missing for quite a long time already.